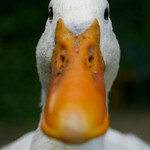 The flock is doing really well, and we’re on track to close on our new home by the end of June. A few people have asked about our temporary set-up, so here are a few details. 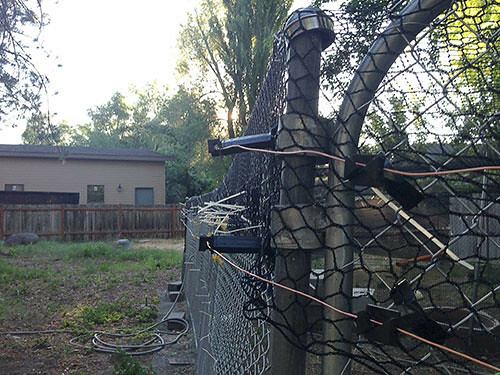 We rented 8 14′ fencing panels to make a temporary aviary. 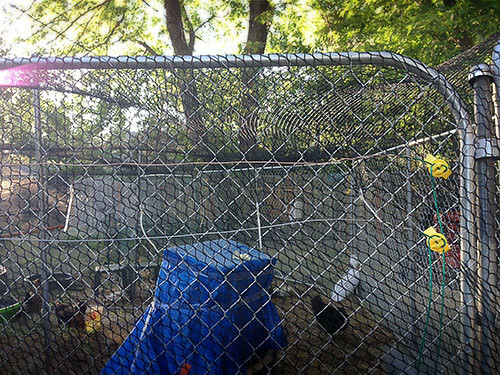 Then we covered it with a 50’x25′ aviary net, knitted with 2″ openings. 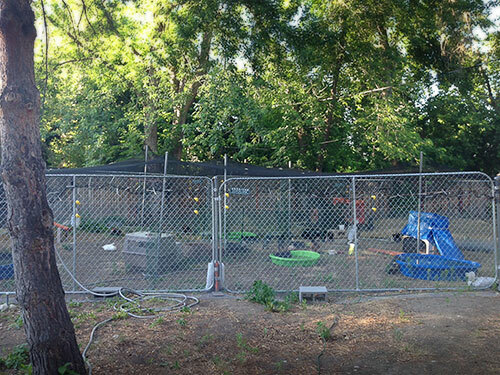 While the aviary netting is great to protect the flock from most predators, it can be chewed through over time. So we also have the entire perimeter of the aviary hot wired to prevent any climbing predators from getting on top of the aviary. 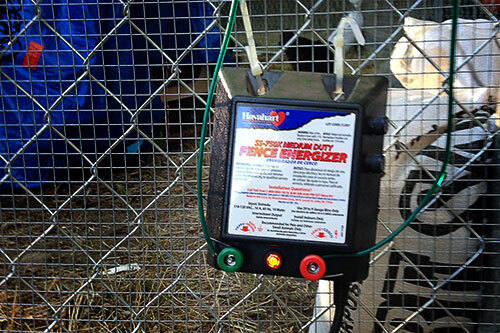 The electric fence is powered by a Hav-a-heart energizer, so it won’t kill any predators, it’ll just make them poop their pantaloons and move along. All along the bottom perimeter of the temporary aviary we have hardware cloth. 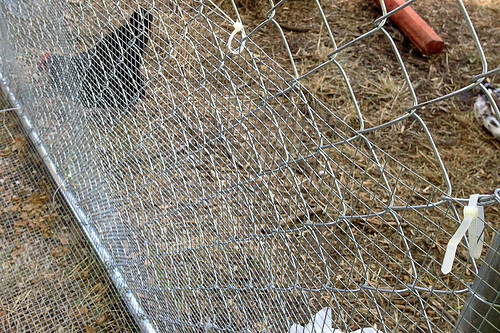 This prevents any critters from reaching through to get at the flock. 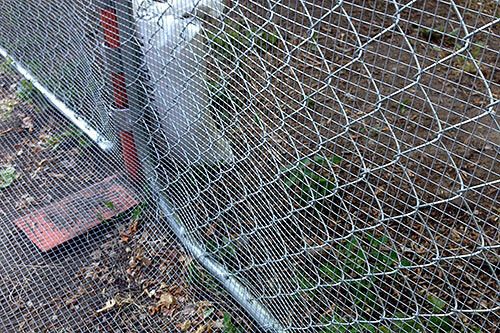 The hardware cloth extends outwards away from the aviary 18″-24″ on the ground, which prevents any predators from digging under the aviary. They don’t know to back up and try digging away to get under. 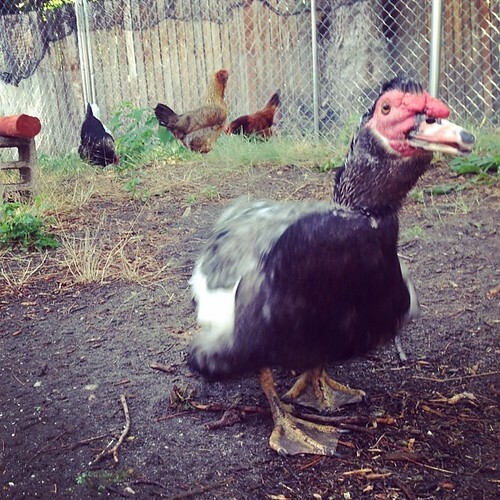 All the flock are adjusting well to the new temporary digs. I am sure they will be happy to be settled in their permanent space soon, but this temporary aviary allows us to keep them safe while we build a permanent aviary as soon as our new home closes. A very special THANK YOU again to everyone for your support during this move. It has been epic, exhausting, stressful and… happy. It’s a big relief to see the flock doing well in spite of so much change, which they really don’t usually like. O’Malley is doing well on his steroids for his lymphoma, and Teddy Crispin will visit a vet on Monday to confirm that his chronic infection is completely cleared up. We’ll keep you posted on new developments as they happen.